Tamilnadu TNSand Vehicle List 2019 can be checked online at the official website at www.tnsand.in. Tamil Nadu government has now released the TN Sand Quarry Vehicle List through the official TNSAND Portal at www.tnsand.in. This vehicle list of sand quarry in Tamilnadu can even be checked through the TNSAND android app. 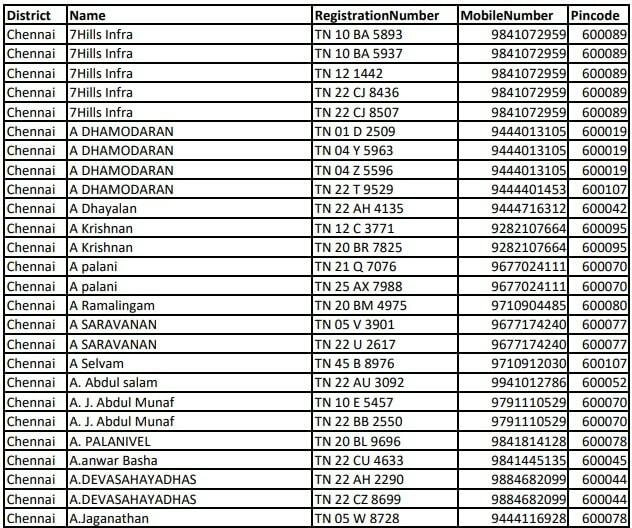 Other than checking the Tamil Nadu Sand Guest Vehicle List, people can check TNSAND sand booking status, register new vehicle, make a new booking for TN sand, move the order, request a refund, check the status of their payment and refund check the complete list of registered vehicles. Below are the complete steps to check the online TNSAND Beneficiary Vehicle List at www.tnsand.in. This list includes the name of the district, name, registration number of vehicles, mobile number and pincode. Now people are not required to wait in long lines for sand. Rather people can simply make vehicle registration and check their name in the TNSAND Vehicle List 2019 at the official website at www.tnsand.in.